(Irvine, CA) February 9, 2019. RF DSP Inc. a provider of 5G MIMO and software defined radio products and design services and a member of the O-RAN Alliance, today announced a wide-bandwidth high-performance 8Tx/8Rx enhanced-MIMO RF Transceiver Module eMIMOx8 for advanced Software Define Radio (SDR) applications, 5G NR small cells and macro cells. 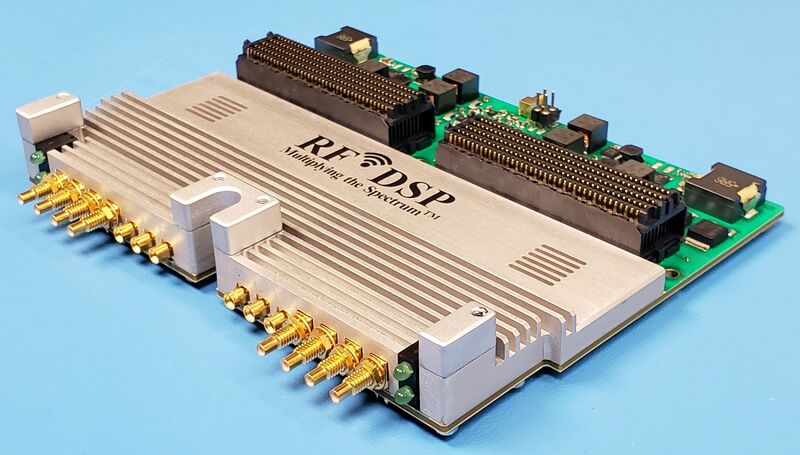 For fast development and commercial deployment, RF DSP provides an extensive Platform Development Kit including FPGA reference design with JESD204B, driver supporting the four Analog Devices ADRV9009 transceivers in the module, clock sync, SPI control, and PC software for configuration/control/status monitoring, RF playback and recording, analysis in MATLAB development environment, and Linux scripts. RF DSP will demonstrate the MIMO operations of the eMIMOx8 module and the Platform Development Kit at the Mobile World Congress in Barcelona from Feb. 25 to 28, 2019 at booth 8.0J21 in Hall 8 for Next Tech. For more information, visit http://rfdsp.com/products/5g-emimox8/. Copyright © 2018 RF DSP Inc. All rights reserved.